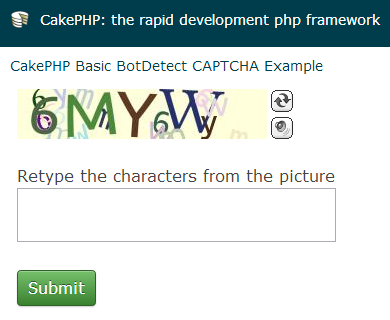 In order to use the CakePHP CAPTCHA Plugin, we have declared Captcha configuration which will be used when loading Captcha component in ExampleController. Detailed description of this approach is available in a BotDetect CakePHP 2 integration guide. After loading the required helpers and the BotDetect Captcha CakePHP component, the example form submits the data to the same Controller action that shows it (index), which is where we check the submitted data and pass it to the captcha_validate() helper function.